Multiple runs highlighted in Live Results, normal? Why are almost all of the runs highlighted in green on Live Results Driver Info? I'm not sure if this is normal or there may be a reason I just don't know it. I would guess the driver's best run highlighted? I noticed that too, and it seems to be when a driver improves his/hers time, it will be highlighted . The same with the "recent runs" on top. Of course! This makes much more sense now. Thanks @JC and @vreihen for clearing this up for me. @Chris it would be cool if there was a way to distinguish the best run from the rest. I'm just suggesting, I hope I don't come across as nit picky with my posts. You have an AMAZING piece of software and am very happy with our club's purchase! 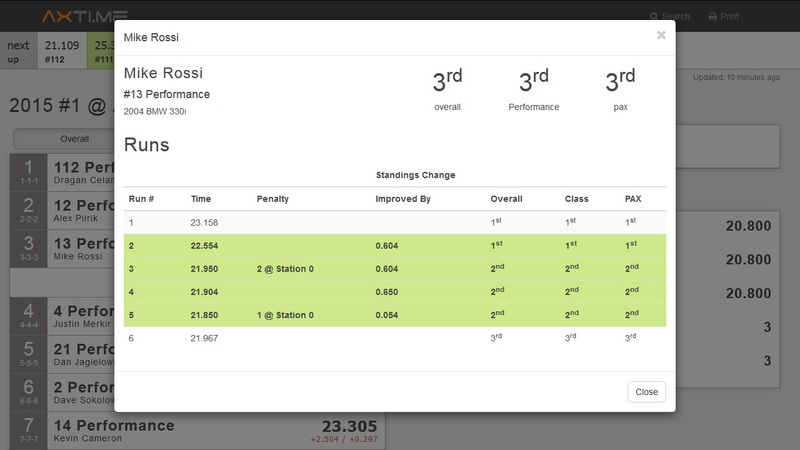 It is indeed showing that the run improved the driver's best time. @Chris after looking at this again, the last highlighted run on the list would be the driver's best. So that's simple enough. However, if the cones are counted - two out of the four 'improved' runs, wouldn't actually be improved at all (this is what I was referring to on the phone when I mentioned cones on LR weren't being counted). I would not highlight the run in green if the time + any penalties are not an improvement over the driver's best time. @MarcGSR The time displayed on the Driver Info is raw time. You're right that there is something off about this driver. Cones aren't being counted for computation of the time off best. I'm guessing that these were late cone calls (cones were entered after the run was completed) and perhaps I'm not recalculating the time off best. Actually, I just checked the code, and that is it. We saw the same thing in Live Results on the weekend. The cones are not displayed in the results (just shows raw time) although they are taken into account when computing the standings. Here's a screen grab from someone's phone. See Corey in 6th position. His time is 63.481 +1 but you don't see the +1, although he's correctly in 6th because that's actually a 65.481. @canadabeau the uploaded image is showing fine for me. Except, it looks like it has been uploaded twice (there are two of the identical image). @Chris this is exactly what happened at our event, members using live.axti.me were coming up saying the cones weren't being counted. I assured them they were, as you can tell by the rankings.